The field of nuclear medicine is consistently advancing treatments for cancer and numerous other diseases, and in doing so, transforming the future of patient care. 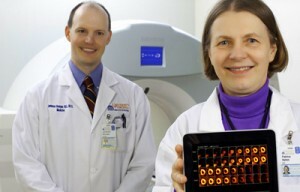 The Division of Nuclear Medicine at the University of Virginia is at the forefront of modern clinical medicine and technological progress in this area. Clinical service is provided at the main hospital as well as the Emily Couric Cancer Center—a National Cancer Institute Designated Cancer Center—directly across the street from the main hospital. Nuclear medicine is one of the most effective methods to check for the recurrence of cancer. Unlike other imaging techniques that identify disease and disorders based on structural appearance (X-ray, MRI, etc. ), nuclear medicine imaging techniques employ a very small amount of radioactive material to diagnose and treat diseases and conditions based on the function of the organ, tissue, or bone. A typical scan consist of three stages: first, a radiopharmaceutical agent is administered to the patient; next, gamma camera detectors capture an image from the radiation emitted by the radiopharmaceuticals that have accumulated in the area of interest; then a radiologist examines the resulting 3-D images of the physiological functioning of the affected area. Also used is Positron Emission Tomography (PET) which employs the latest technology, PET and CT. PET-CT combines PET and CT in a single machine that provides information about metabolism linked to CT anatomy in a single exam. This modality is available for all approved clinical indications, including oncologic, neurologic, and cardiac.